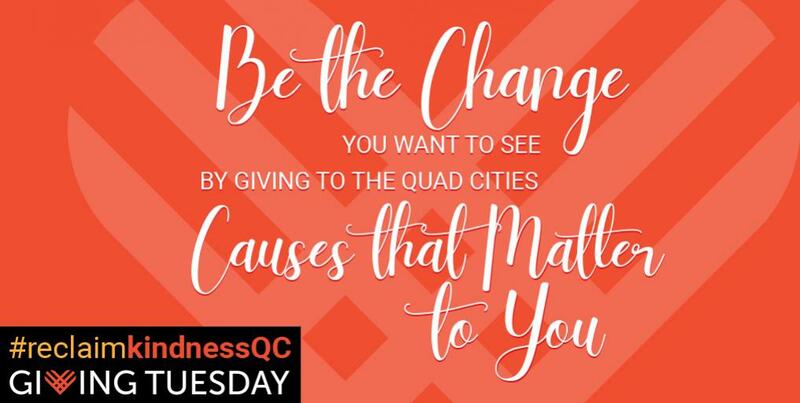 Be the change you want to see by giving to the Quad Cities causes that matter to you. The concept is simple. When we #reclaimkindnessQC on Giving Tuesday, November 27 we're giving back to our local community. Giving back to the causes you believe in - to the causes you love. Every dollar donated and every hour given to lift up your favorite charity makes a difference in the Quad Cities. When we #reclaimkindnessQC, we are banding together with other nonprofits to take back kindness in the Quad Cities. You are joining with other donors to be change makers - and to improve lives in our region. Thank you for championing kindness in our region. Thank you for standing up for the causes that matter to you. Thank you for being the change we need. What is change worth to you? Reclaim the kindness that has been lost around the world and in our community. It starts with you. It changes with us. Now is the time. Make a donation to your favorite local charity on Giving Tuesday, November 27. Volunteer your time to your favorite cause. Need suggestions on where to volunteer? Check out our volunteer hub. Your gift to United Way will help improve lives in our community. Give online.